The secret life of the paddock tree. The majority of prime agricultural land in southern Australia was once densely vegetated with scrub, woodlands or forests, typically dominated by eucalypts. 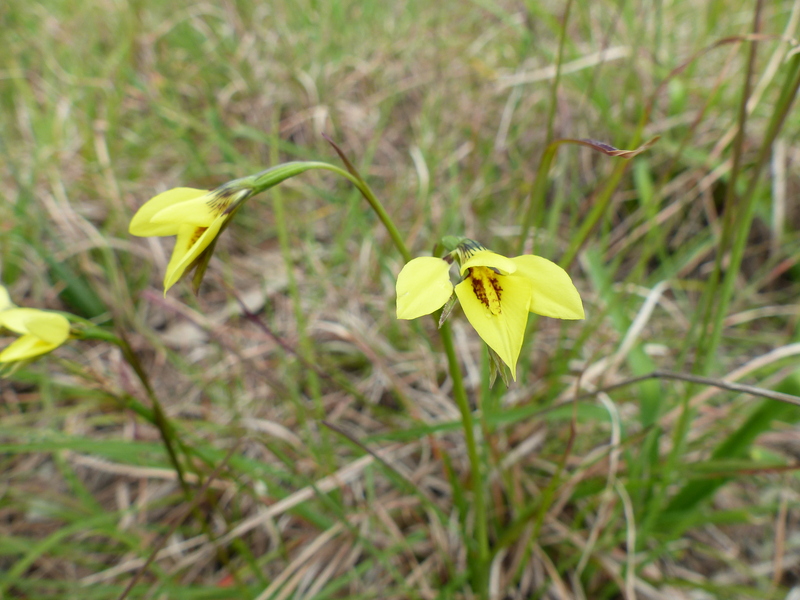 In Victoria’s Gippsland region, one of Australia’s most fertile areas, most of the land has been so highly modified from clearing it is often difficult to determine what the original vegetation communities were. The only way to do this is to observe the handful of remnant species remaining to work out the original EVC (ecological vegetation class) and this vegetation is often in the form of the paddock tree. This drastic change to the landscape is unfortunately typical of a lot of agricultural land in Australia. Throughout the late 19th and early 20th century the clearing of vegetation in southern and eastern parts of the continent was on such a grand scale and in such a relatively short period of time that many species, both plant and animal, had no time to adapt to this change and an extraordinary amount of species became extinct or threatened. According to the Victorian Environmental Assessment Council VEAC Report 2011 it has been estimated that 30% of Victoria’s native fauna and 44% of native flora have become extinct or threatened with extinction. In Gippsland, the Strzelecki Ranges and nearby foothills originally consisted of mostly wet or damp forest which before European colonisation was seldom touched by fire, unlike the grasslands or drier forests and woodlands of the Gippsland plain which were periodically burnt by aboriginal people. In the late 1800’s to early 1900’s these moist slopes were beginning to be transformed into bare rolling hills by the white settlers who were allocated small allotments. These had to be cleared of a certain percent of their vegetation in a short period of time, otherwise they forfeited their rights to occupy the land. At first this was done by axes and saws which must have been an enormous task but later was done by burning the forests to open them up and make them easier to manage and clear. Wet forests are less able to adapt to intense fires and much of the vegetation didn’t recover. These bare areas were then transformed into grassy paddocks where stock and crops were farmed. Typical dairy farmland in the western Strzelecki Ranges, originally consisting of wet forests. Note the major landslip in the central left of the photo. The expansion of rail lines into South Gippsland in the 1890’s created an exponential amount of settlement in the area and subsequent clearing of forests for towns, roads and agriculture. 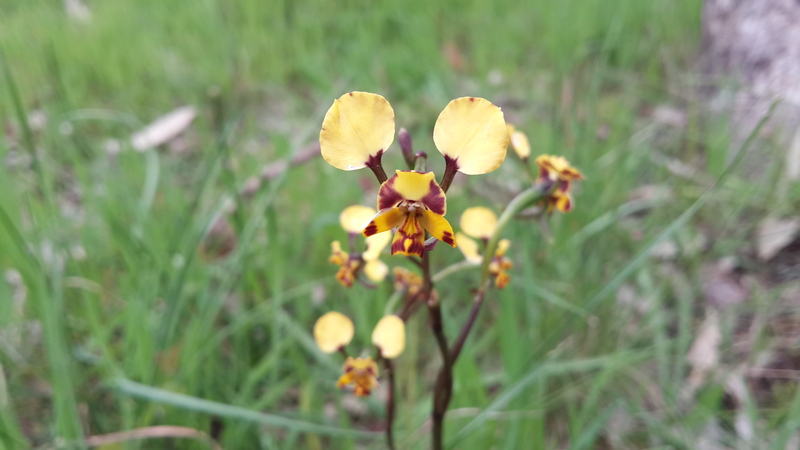 This has resulted in a patchwork of often isolated vegetation in the form of ‘island’ reserves, parks, roadside remnants and the topic of this blog, the paddock tree. Native paddock trees, however isolated they are, are important in the ecosystem as they provide food, shelter and protection for a wide range of species. Bats will use tree hollows or loose bark for roosting and rearing young. 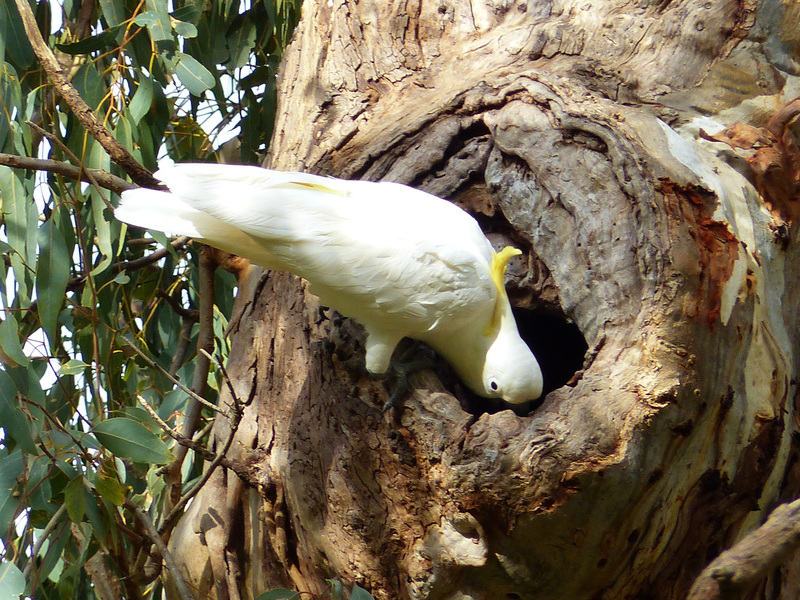 Koalas and possums will often travel over open farmland to utilise isolated trees and many birds will use these to feed or nest in or as stepping stones when accessing other sites. The Koala often has a wide home range and will travel over open paddocks to access isolated trees. In agriculture remnant paddock trees can be important for productivity, particularly when farming livestock as these trees provide protection to stock from the elements (less stress=more productivity). So why don’t we put more effort into protecting these assets if they’re so important? Some farmers do a great job at protecting these remnants, often depending on how active or well-funded their local Landcare group is but others can be negligent or misinformed in their approaches. The problem with many native farm trees which become isolated is that they are more susceptible to diseases, parasites (insects, mites, nematodes and some plants), insect damage, stress from the elements, browsing pressure, excessive use of nitrogen-based fertilizers, drying out of soil, compaction of the ground and rubbing from livestock. A recent study by scientists from Deakin University looked at koala populations and their browsing pressure on Manna Gum Eucalyptus viminalis. It found an initial increase in density of Koala populations resulted in severe browsing of these trees within a small area. This in turn caused a catastrophic drop in Koala numbers due to starvation. Insects also can have a major effect on tree health due to lack of predators and can cause extreme defoliation, root or basal bark damage and are often attracted to an already stressed tree as this is when the tree’s defences are down. An insect borer is likely to have caused the death to this Blackwood Acacia melanoxylon. All these above factors can result in the slow death of the paddock tree with no recruitment of seedlings. Some farmers see their native trees are dying and plant exotic species such as Pines which are less prone to being attacked. But there are steps property owners can undertake to protect isolated native trees while still being productive both in an agricultural and ecological sense. Remnant trees and other vegetation can be protected firstly by fencing off stock to avoid damage from soil compaction, browsing and rubbing, erecting the fence at least from the canopy-width out from the tree (ideally twice the width of the canopy). By allowing stock to still use the protection of the tree, but excluding them from compacting it’s roots, the farmer still benefits. Whether it’s an isolated patch of vegetation to be created or ideally a corridor the simple recipe for success is a diversity of species to be planted and adequate weed control. This includes trees, shrubs and larger hardy grasses, all of local province. Smaller shrubs, herbs and grasses can be added in the future once the canopy is relatively established and some minor weed control is continued. Due to the 5 year accumulation of leaf litter and dense canopy layer there is no more need for weed control and there is already a recruitment of species from self-seeding. One mistake that many well-meaning landowners or groups do is lack diversity in their plantings. By having an array of nectar-producing plants, species like honeyeaters, bees, wasps and butterflies are attracted to feed on the flowers. 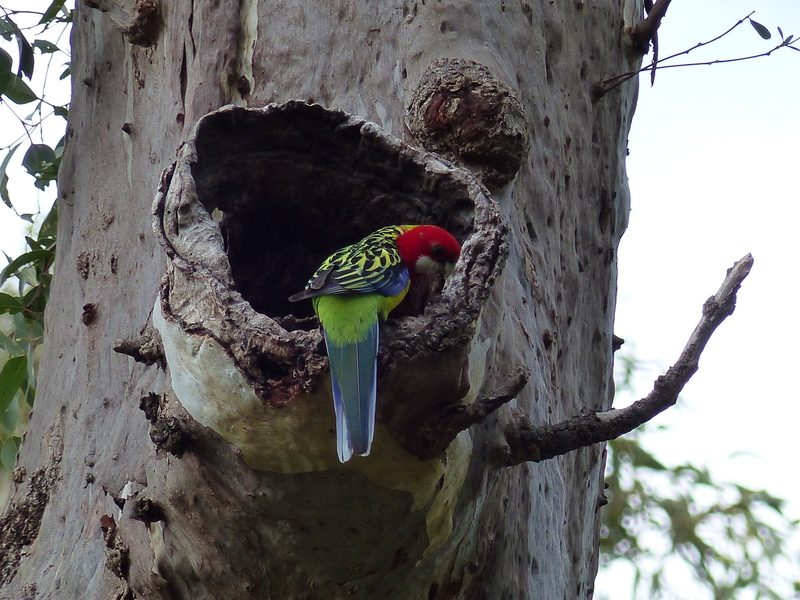 Birds such as parrots and Silvereyes are attracted to fruiting plants and seed-producing plants like grasses attract native Bush Rats and Rosellas, among others. The leaves of different plants often have specialist insects which feed on them and this insect fauna attracts predators such as spiders, reptiles and a wide range of birds. Then there’s the protection from predators and nesting opportunities the plants provide. All these factors protect any remnant isolated trees from damage and allows the tree to hopefully produce viable germinates and successive generations. Additional vegetation will protect the tree by also increasing the soil’s microbes, humus layer from leaf litter and protection from the elements. By attracting a diversity of fauna to a patch this in turn will protect the vegetation from pests as there will be more predators to keep them under control. A common example of imbalance with isolated trees is the prevalence of the parasitic Australian mistletoe. The widespread Mistletoe Bird feeds on the fruits of the mistletoe and will often target isolated trees or trees on the edge of a remnant patch. The seeds of the fruit are excreted on the branches of the isolated tree where they grow and often infest the tree to the point of death. 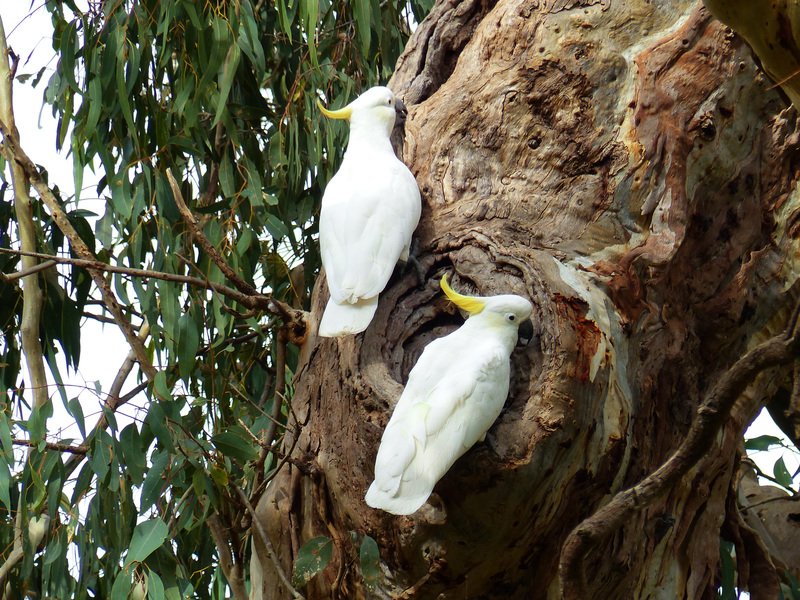 This is due to a lack of mistletoe predators in open areas such as some of the Jezebel butterflies Delias spp whose caterpillars feed primarily on mistletoe leaves and keep them relatively in check in healthy bushland. A tree heavily infested with Drooping Mistletoe Amyema pendulum. Imperial Jezebel Delias harpalyce, Fish Creek, Vic. The caterpillars of this species help control mistletoe. Unfortunately, paddock trees are a dying breed but without more education and funding available to farmers and other landowners we’ll keep losing more and more of them. Categories: agriculture, conservation, fauna, flora, gippsland, revegetation, victoria | Tags: agriculture, clearing, conservation, fauna, flora, gippsland, paddock, revegetation, tree, victoria | Permalink. Although it’s got an unfortunate name, the Knob Reserve in Stratford is a hidden little gem tucked away behind the town. 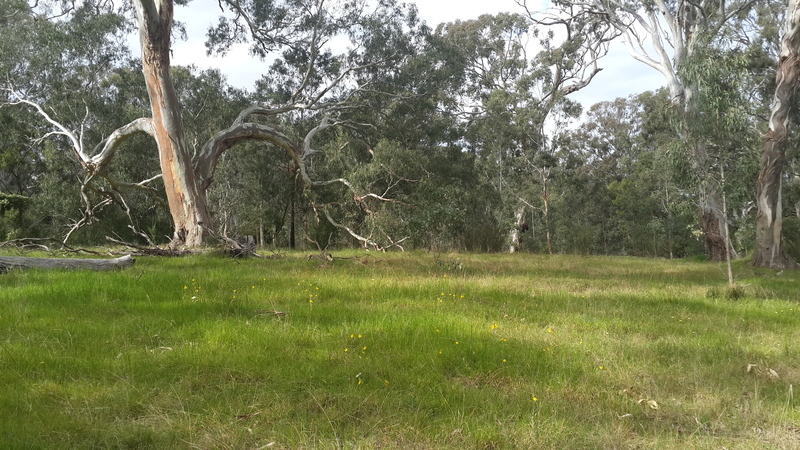 This park is 56 hectares of mostly Gippsland Plains Grassy Woodland, an EVC (Ecological Vegetation Class) which is threatened and few relatively intact remnants remain in the region due to clearing for agriculture. Plains Grassy Woodland, Knob Reserve. Historically this park is very significant to the indigenous Gunaikurnai people and has been a traditional meeting place for thousands of years. The ‘knob’, a prominent bluff along the banks of the Avon River would have been seen a long distance away. 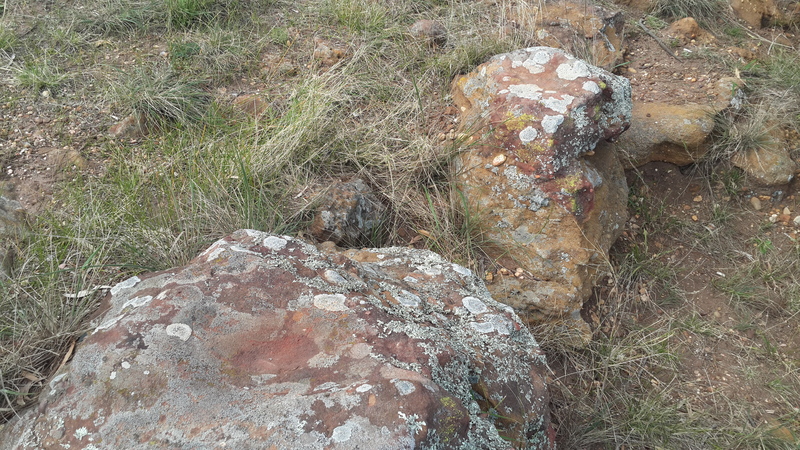 Evidence of their occupation can be found on and around the bluff including scar trees (trees with bark removed for canoes or shields) and sandstone grinding stones which were used to sharpen tools such as axes. Panorama from the bluff overlooking the Avon River. Early spring is the time when this area comes to life and although the grass is still green from winter it doesn’t take long for the soil and vegetation to dry out to a crisp. When I visited last week a lot of the herbs, lilies and orchids were in full bloom and the birdlife was extraordinary. 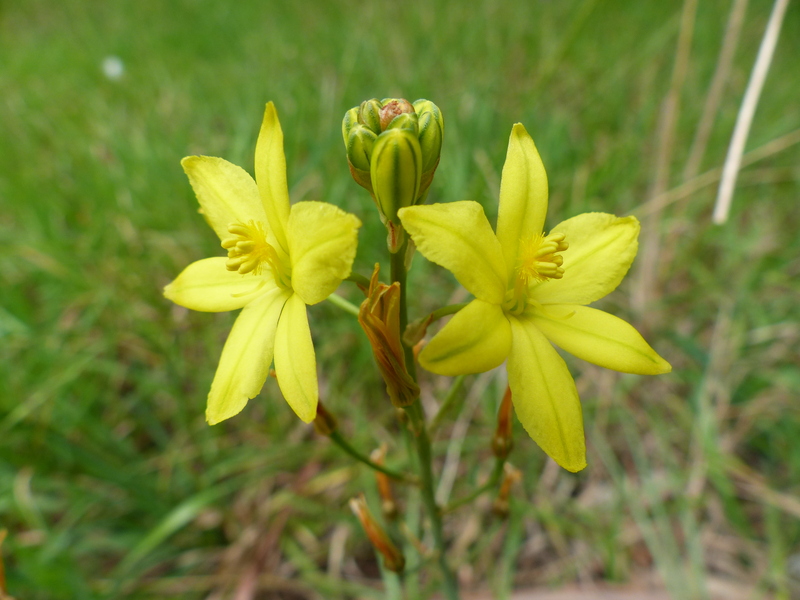 The Bulbine Lily Bulbine bulbosa was particularly common and the large yellow flowers could be seen dotted everywhere. Chocolate Lilies Arthropodium strictum were also very common but only just beginning to form flowers and I think if you went back next week it would be a haze of purple. 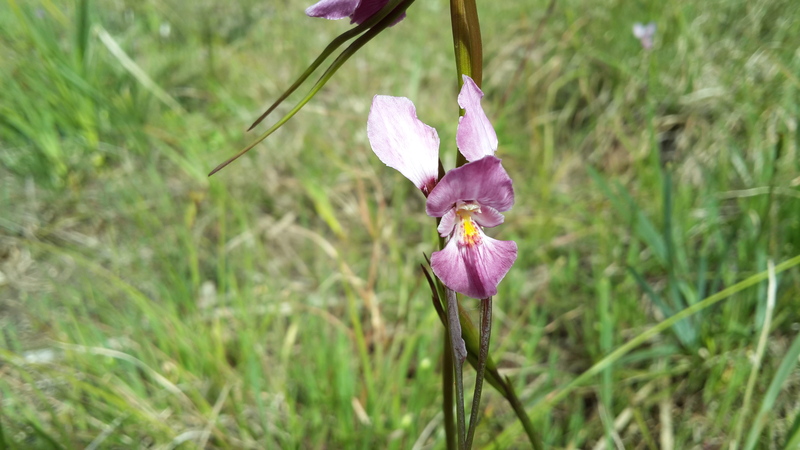 This reserve has a high number of Donkey Orchids Diuris spp, one of them, the Purple Diuris Diuris punctata is listed as threatened. 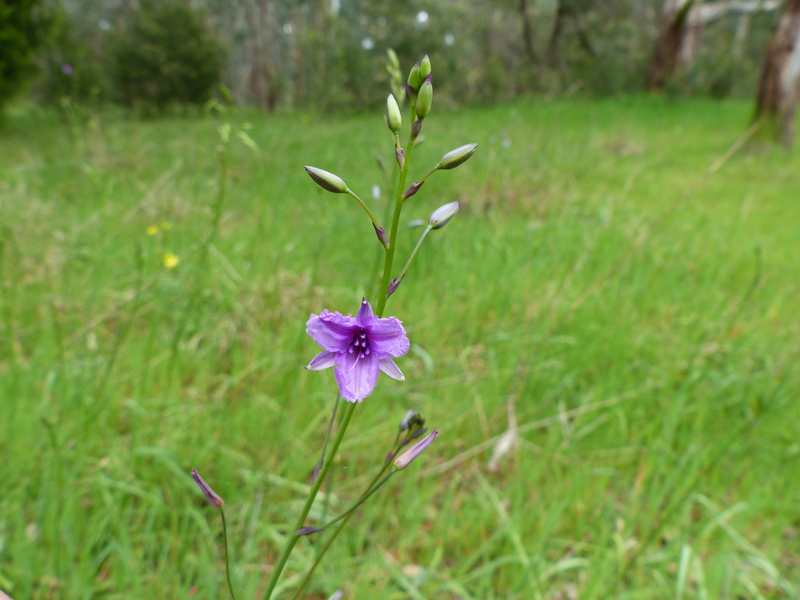 Although there weren’t any I could see flowering yet the photo below is from another trip I did to a grassland reserve near Bairnsdale the next day. Leopard Orchids Diuris pardina and Golden Moth Orchids Diuris chryseopsis weren’t common but scattered in the denser grasslands. Like I mentioned the birdlife was amazing and within half an hour I had a tally of nearly 40 species! 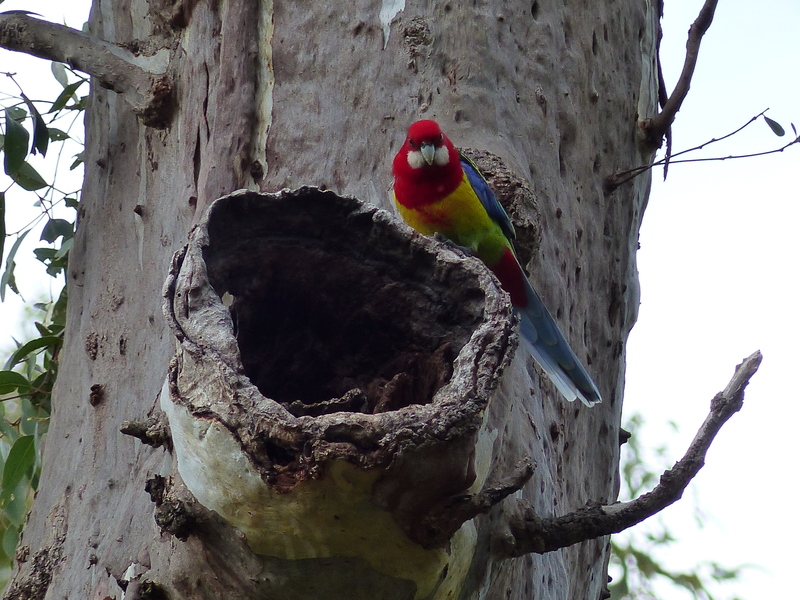 Parrots in particular were everywhere and many were searching for nesting hollows in the old Red Gums. We’re heading back to this reserve next week for work and it should be great to see what else might pop up. Categories: aborigines, birds, conservation, east gippsland, fauna, flora, gippsland, orchids, parks and reserves, threatened species, victoria | Tags: aborigines, birds, fauna, flora, gippsland, Gunai kurnai, hollows, lilies, nesting, orchids, victoria | Permalink.